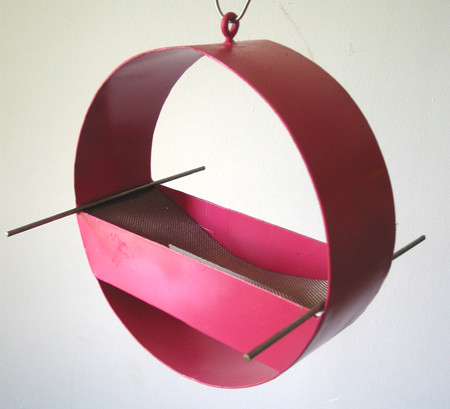 Metal sculptor Joseph Papendick creates beautiful outdoor birdhouses and bird feeders. The collections I'm sharing with you here are his modernist and cubist designs. Made of steel and treated with primer and 2 coats of bright and beautiful enamel colors, they are available in the colors shown or any color combinations you'd like. These welded steel bird feeders are made entirely by hand and are 12" in diameter The stainless steel screen, which holds the seed, is welded to two stainless steel rods. These rods fit into grooves at the corners of the piece. The rods hold the seed screen in place much like a hammock, and also serve as perches for birds. The entire screen and rod section is removable for cleaning. These hand crafted, welded steel birdfeeders stand approximately 6' tall. The upright support is welded to an "I-beam" shaped base which has been uniquely designed to allow the piece to stand securely upright when "planted" into the ground approximately 8 -10 inches deep. 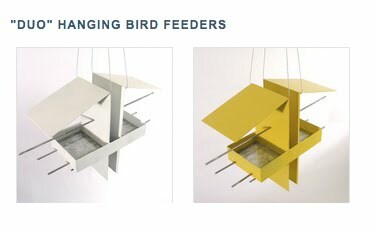 The 'feeder' portion contains of a stainless steel screen designed to hold bird seed a safe distance off the ground. Shielded to a degree from rain, wind, and sun - the stainless steel screen allows for rapid drainage of any water, and will never rust through. Once 'planted' into the soil, the design allows for the roots of surface vegetation to reach through and firmly anchor the piece into the ground. 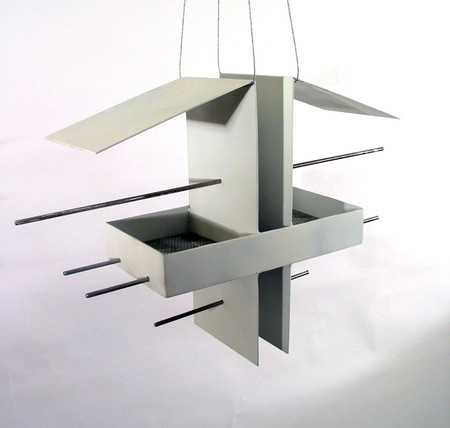 This first series of "Cubist" bird feeders measure 11" tall X 8" wide. Two stainless steel rods, inserted through holes drilled into the sides of each piece, allow a perforated aluminum screen for bird seed to simply rests on the rods. 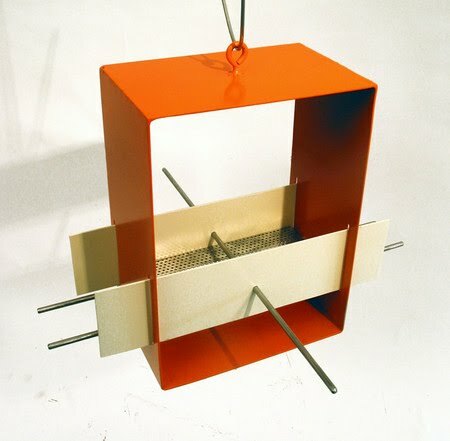 This feeder screen sits between the boundaries created by two rectangular slats which are inserted through cuts made into both sides of the pieces. An additional stainless steel rod runs perpendicularly through these slats, serving to stabilize the rectangular elements, while also serving as an extended perch for birds. Keeping the various elements separate - without welding - allows for them to be painted separately, now in in the future. These pieces are each treated with spray primer and enamel. Although they are pictured here in only select colors - with white as the sole horizontal color - they can be easily finished in any combination of colors you'd prefer. 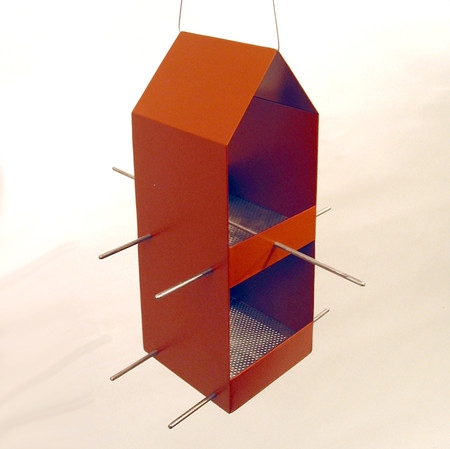 The "Duo" series of hanging bird feeders measure 14" tall X 18" wide. They are made from hand bent welded steel, stainless steel, and aluminum. Divided down the middle by the roof structure, each of the two separate sides holds a perforated aluminum screen for bird seed. The seed screens simply rest upon the two stainless steel rods which are inserted through the piece. Along with two other rods, of differing lengths, these rods also serve as perches for birds . The Longest is 22" wide. The pieces are designed to hang by twin ropes of galvanized steel wire, approximately 20" long. Each of these support ropes rests under the angle of the two bent roofs, coming together at the top in two loops. The pieces are treated with two coats each of spray primer and enamel. Although they are pictured here in only select colors, they can be easily finished in any color you'd prefer. 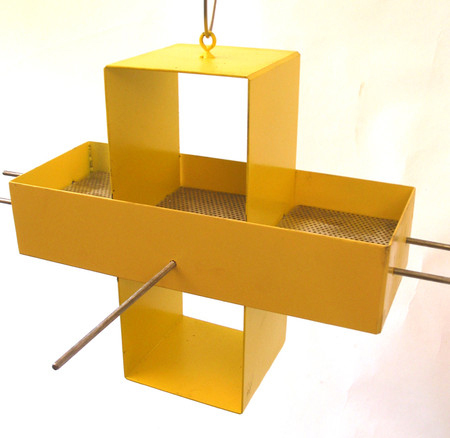 The design of this 'Plus' series of bird feeders features two rectangular elements. The two main sections are not welded together. Instead they nest within each other, and a pair of stainless steel rods, running through the middle of both pieces, holds them perpendicular. Three perforated aluminum screens for bird seed rest on these rods. Since they are cut to fit within the three individual sections, the screens also serve to prevent movement of the horizontal piece from left to right. I particularly enjoy it when everything about a design just seems to work together! These pieces measure 12" high, 14" wide, and 5" deep. They have each been finished with two shades of spray enamel, one slightly darker than the other. 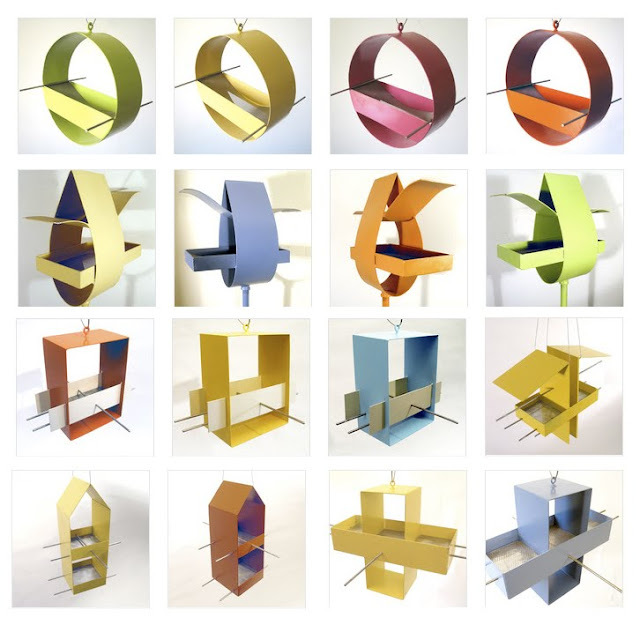 Any of the pieces in this series can easily be finished in whatever color combination you'd like to see. 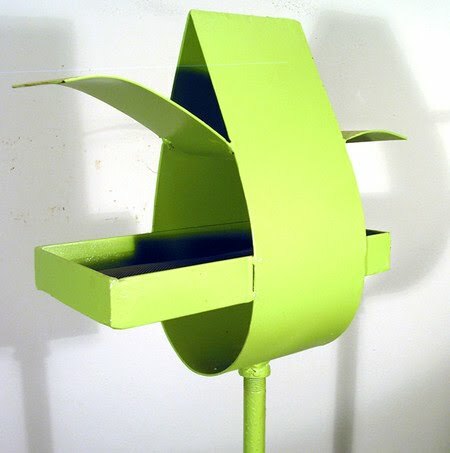 Inspired by the shape of old wooden birdhouses, these new "Home" series bird feeders measure 6" square and 18" tall. On each of the two levels a perforated aluminum screen, designed to hold bird seed, is supported by two stainless steel rods which are inserted through the piece. These rods also serve as perches for birds. The pieces are designed to hang by a rope of galvanized steel wire, 20" long, which has been looped permanently through the top section. They are treated with spray primer and enamel. As such they can be finished in a variety of colors. Shop for the above here. Right you are, nice post. Now if he could take time to create some striking mail boxes. I agree with the above comment, some innovative striking mailboxes would be great. Can you image a street of crazy designed mailboxes.